When Leo Santa Cruz retained his WBC World super-bantamweight title with a comprehensive defeat of Cristian Mijares, there was only one man he wanted next – Carl Frampton. 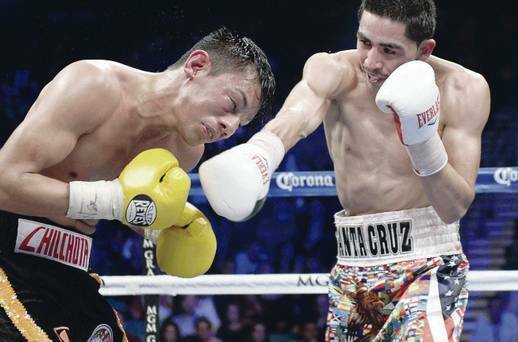 Santa Cruz will get his wish if Frampton can overcome two-weight World champion Hugo Cazarez on Friday night at the Odyssey Arena. Should Cazarez triumph, then it will be an all-Mexican affair. "That would be a massive fight in Mexico," said Cazarez. "That's the fight I want, there would be a big crowd in Mexico for that. "I could have waited for the fight to happen but I like a challenge and that is why I am here to face Frampton." A large fistful of dollars would have had something to do with it as well as Cyclone Promotions had to use plenty of persuasion to draw Cazarez out of his homeland for such an important fight. Frampton manager McGuigan has no doubt the Jackal will prevail before going on to face Santa Cruz in a blockbuster fight. "Santa Cruz and Carl is the biggest and most exciting fight in the super-bantamweight division," said McGuigan. "The two styles will come together to make for an amazing fight. "Golden Boy Promotions and Showtime television can see that as well, that's why Golden Boy are going to be here on Friday night." The question everyone wants to know is just where Santa Cruz-Frampton will be held – assuming the Belfast man defeats Cazarez. McGuigan said: "I want to make it worth Santa Cruz's while to come here and of course that will require a big offer. Ravenhill is a possibility and I will do everything I can to bring the fight to Belfast but we have to accept that we may have to travel to America for the world title fight. "And we also have to make it clear that in no way are we overlooking Hugo Cazarez because he is a very experienced, very tricky customer who can see a big fight with Santa Cruz for himself." Frampton is equally adamant that he is not looking past Cazarez, even though the dream fight with Santa Cruz is looming on the horizon. Frampton said: "It's great that Santa Cruz has been mentioning my name, he's serious about the fight unlike Kiko Martinez and Scott Quigg who talk a lot but don't really want to fight me. And who can blame them? "Santa Cruz and me is the fight that everyone wants to see, everyone knows it will be exciting because both of us like to have a fight. "But if I don't beat Cazarez then there are no world title fights. "So I just have to keep my focus on Cazarez and the danger that he poses. I took one fighter easy in the past, Robbie Turley, and made it hard for myself so I won't be making that mistake again and certainly not with Cazarez."